Gr 8 Up–Aspiring rapper Bri records "On the Come Up" to protest the racial profiling and assault she endured at the hands of white security guards at her high school. The song goes viral, and Bri seizes the opportunity to follow in the footsteps of her late father and lift her family out of poverty, but her loved ones worry, especially when some listeners paint her as an angry black girl inciting violence. Tension mounts as Bri's mother loses her job, Bri's relationship with her beloved aunt and musical mentor splinters, and a new manager dangles the prospect of fame and wealth—at a price. 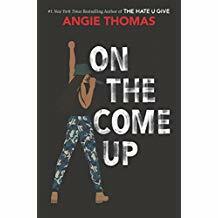 Set in the same neighborhood as Thomas's electrifying The Hate U Give, this visceral novel makes cogent observations about the cycle of poverty and the inescapable effects of systemic racism. Though the book never sands over the rough realities of Garden Heights, such as gang warfare, it imbues its many characters with warmth and depth. While acknowledging that society is quick to slap labels onto black teens, the author allows her heroine to stumble and fall before finding her footing and her voice. VERDICT Thomas once again fearlessly speaks truth to power; a compelling coming-of-age story for all teens.